Increase Foot Traffic to Your Retail Location with Augmented Reality - Upcoming Media Inc.
2017 saw many retail icons, such as Reitman’s, Le Chateau, and Sears, either close dozens of stores or cease operations completely in Canada. These closures resulted from a reduction of in-store foot traffic due to increased competition, the rise of online shopping, and changing customer expectations. In recent years, consumers have been putting a heavier emphasis on getting a satisfying customer experience whether shopping online or in-store. Retailers could solve this by adopting innovations that provide great customer experiences, keeping their brands top of mind with consumers. Or, as Gary Vaynerchuk succinctly put it, retailers need to “innovate or die”. 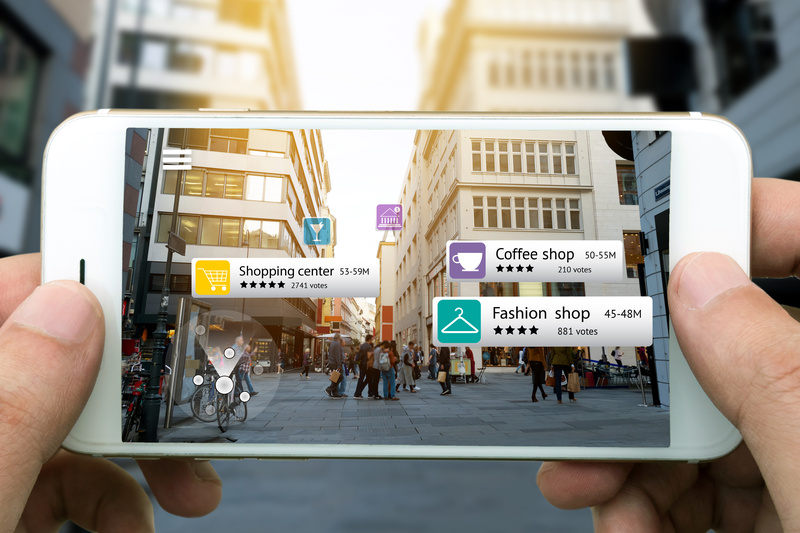 Now, thanks to augmented reality (AR), retail marketing managers can create fun, engaging experiences that will bring people back into their stores, wherever they need their customers to be. With Upcoming Media, the possibilities of creating amazing customer experiences are virtually endless. All customers need to do is download the free Upcoming Media Solutions app for Apple iOS and Google Android to start engaging with your brand on a whole new level. Augmented reality change rooms: With a mirror and LCD screen, your customers will be able to choose, try on, and overlay clothes until they put together the perfect outfit. This also eliminates the need for them to carry handfuls of clothes (that you might have to clean up later) and makes the entire shopping experience faster and more fun. Virtual stores…anywhere: You can set up virtual stores in parking lots, tourists spots, parks, or wherever you like, allowing customers to “browse” the virtual shopping aisles with the phone on their mobile device. By pressing on an item, they can add it to their shopping cart. When they are done, customers can check out and arrange for home delivery. Branded treasure hunts: Think Pokemon Go meets your brand. Both kids and adults will love hunting for virtual items through the app in your store. Pick any theme or items you want customers to find, and merge the experience with your products and services. Special events: Create a fun AR experience in a school, park, or other open space where families can play fun, interactive mini-games. Tie the games to your brand to increase awareness or your products and services. Virtual product specs: Imagine your customer’s delight when they scan a product in your store – and suddenly all the information they need to make an informed purchase appears before their eyes! Product specs can include product and pricing information, tips on care, and colour and style options. The possibilities of creating an engaging AR experience are virtually limitless, but all geared to create a buzz around your brand and build great relationships with your audience.